Joe is growing up, and so are his readers. In Book 3 of the Joe the Gardener Series, big brother Joe enlists the help of his lively little sister, Pam, in planting strawberries to make some jam. Joe is growing up, and so are his readers. In Book 3 of the Joe the Gardener Series, big brother Joe enlists the help of his lively little sister, Pam, in planting strawberries to make some jam. Joe is the “expert” but Pam keeps him on his toes with her questions. Their conversations about gardening help advance the story and show their personalities. Included at the end of the tale is a suggested lesson for young readers to practice writing dialogue. There is also a recipe for strawberry jam! 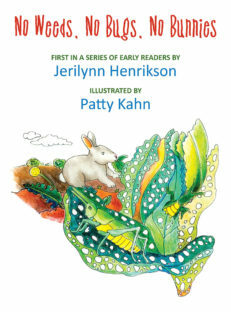 This is Jerilynn Henrikson‘s eighth book for children and the final book in the Joe the Gardener Series. 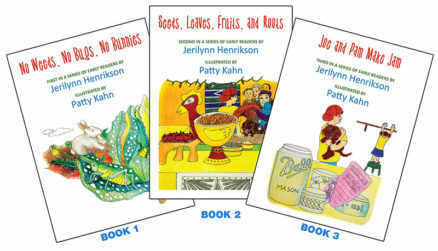 In this series, she has combined her passion for writing, her love of children, and an obsession with gardening to create stories that will inform, entertain, and encourage youngsters to become readers, writers, and gardeners. 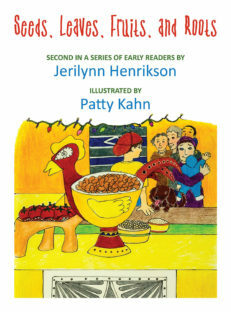 Find other books and products for kids by Jerilynn Henrikson at www.prairiepatchwork.com. 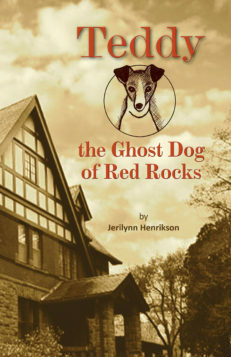 Her historical fiction chapter book for middle grades about the family of William Allen White, Teddy the Ghost Dog of Red Rocks. As a lifelong artist, Patricia Kahn, Ph.D. has worked in the areas of commercial interior design, art and medical illustration. She served as the director of an art therapy program, a public school art teacher and a university professor of art education. 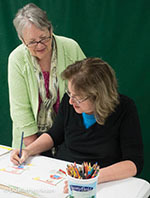 She currently is involved in art making, teaching art and running an outreach art program in Topeka, Kansas. Besides illustration, she specializes in Jewelry, Mosaics, Fiber Art, Drawings, and Cards. Enjoy the Fruits of your Labor! Jerilynn Henrikson and Patty Kahn created a trilogy of early readers featuring Joe and his gardening adventures. Learn the joys of planting, growing, harvesting, and reading! If you want an imaginative book, read Joe and Pam Make Jam! 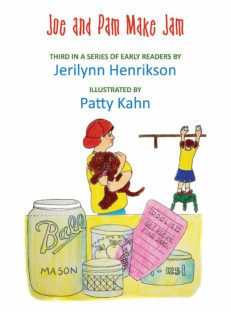 This creative children’s book intrigues the reader with family, puppy, and gardening experiences. Whether you are curious about gardening or have no interest in fruits and vegetables, you will enjoy the characters and their efforts designing a neighborhood garden plan. Rhyme, repetition, and imagery enhance this story. The text flows smoothly introducing words at a gradual pace; repetition is not overdone and engages the reader. Concise sentences are crisp and almost musical. If you want to enjoy the fruits of your labor, read Joe and Pam Make Jam! Readers will notice lack of sibling rivalry and appreciate the theme of this fable. Joe and his sister Pam are determined to select a fruit that will grow in their neighborhood and be easily harvested. Each member of the family contributes to preparing, purchasing, planting, and preserving the strawberries. Witness Joe’s maturation and character evolution, as he and Pam collaborate and communicate effectively throughout the summer. Readers will be inspired by the family’s shared determination in the gardening process. 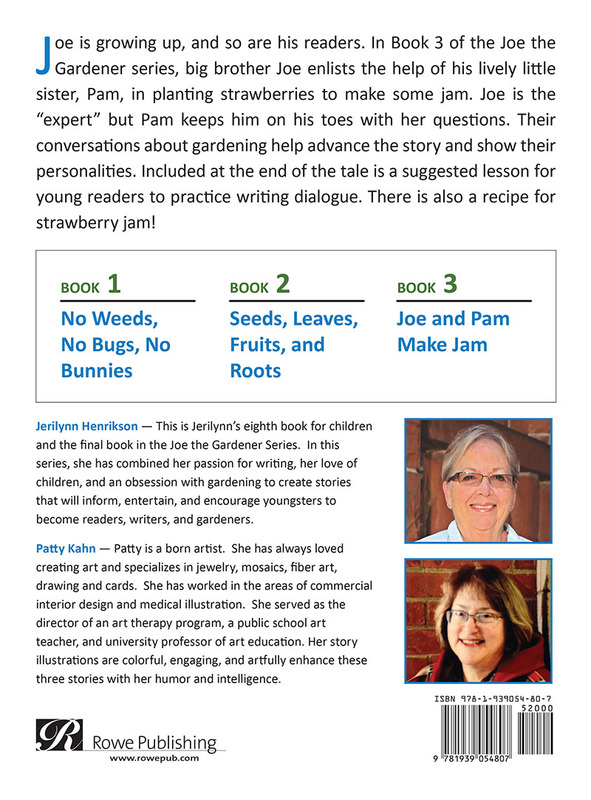 If you want a blossoming blueprint, read Joe and Pam Make Jam! Dialogue and writing activities guide and motivate novice and experienced readers. Punctuation and sentence structure suggestions model proper style and spark creative writing. A delicious strawberry jam recipe provides clear instructions and careful attention to safety. No matter your cooking experience or economic status, this nutritious connection to family food brings everyone together. If you have no prior knowledge of gardening or are a master gardener, you will be entertained and enlightened. Learning beyond the book is an extended feature. If you like artwork, read Joe and Pam Make Jam! Original drawings creatively brighten the pages and supplement the story. Primary colors highlight and define the setting and characters enhancing the theme. 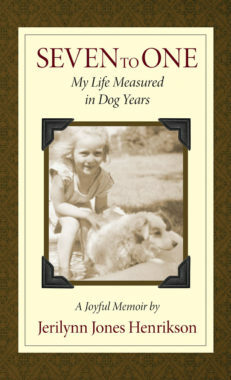 The number of pages and dimensions of the book invite readers of any tactile mobility to cuddle and read with pleasure. Ideal for readers of all ages and interests. If you like sharing a successful gardening experience, read Joe and Pam Make Jam again and again.